thesupergreat: Superimpose Me-I Want Topanga Hair! If you were a girl growing up in the early 90's, it is very likely you coveted the thick, lustrous locks of Topanga Lawrence, Cory's girlfriend on "Boy Meets World". 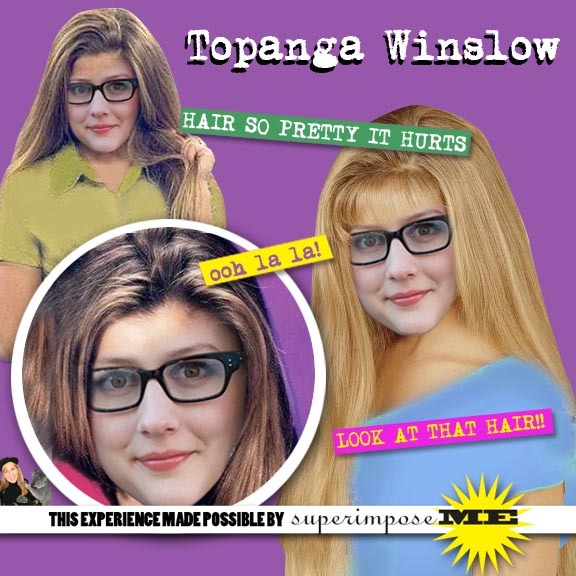 So I was not surprised to receive a request from Alexis Winslow begging for Topanga hair. I'm only surprised I didn't receive more requests like this from other women across the country and world. Alexis, I'm thrilled to be able to make your wish come true!! YOU LOOK TOTALLY AWESOME!!!! Oh my gosh! This is so amazing! THANK YOU SUPERIMPOSE ME FOR MAKING MY DREAMS COME TRUE!!! Thanks to you, I no longer have to lament lack-luster-locks. Your photoshop skills are unparalleled. It looks so real!